Where: White Eagle Hall , Victoria B.C. 35 years ago, Tla-o-qui-aht First Nation Chief Moses Martin declared Meares Island in Clayoquot Sound a “Tribal Park” during a blockade to stop logging by MacMillan Bloedel in the island’s spectacular ancient forests. This was the first protest against old-growth logging in Canadian history and a remarkable display of solidarity between the Tla-o-qui-aht and Ahousaht First Nations and local environmentalists. As a result of this historic event, Meares Island’s extraordinary natural and cultural heritage remains safeguarded to this day and the Tribal Park has also provided a model that has inspired a movement to establish new Tribal Parks and Indigenous Protected and Conserved Areas in Canada and increasingly around the world. Join us in celebrating this monumental event on Wednesday April 17th at the White Eagle Polish Hall from 6pm until 9pm. Guest speakers include: Tla-o-qui-aht Chief Moses Martin, Dr. David Suzuki, and Mr. Miles Richardson from the Haida Nation. The event is co-hosted by the Iisaak Olam Foundation, T’souke Nation Chief Gordon Planes, and Melissa Quesnelle of Kainai Nation with musical performances by Art Napoleon, award-winner Indigenous singer/songwriter and host of the international food show “Moosemeat & Marmalade,” and Tom van Deursen from Kalso BC band Small Town Artillery! 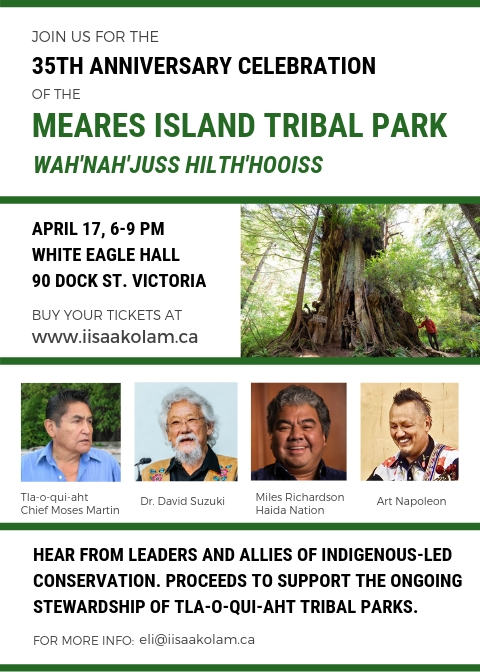 To learn more about the declaration of Meares Island Tribal Park, check out this video featuring Iisaak Olam Foundation founder Eli Enns.